Essential PH-1 was launched in May 2017. 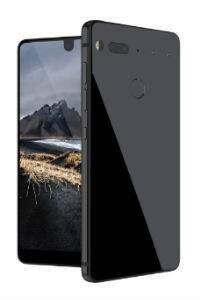 Essential PH-1 features a 5.71-inch QHD LTPS LCD bezelless display with 2560×1312 pixel resolution. Essential PH-1 comes with 4GB RAM and 128GB storage and is powered by an Octa-Core Qualcomm Snapdragon 835 processor. Essential PH-1 runs Android 7.1.1 Nougat. The smartphone has a titanium body, and ceramic back. The display is protected by Corning Gorilla Glass 5 cover glass. Essential PH-1 features a 13-megapixel dual rear cameras (RGB+Mono) with, f/1.85 aperture, hybrid autofocus combing contrast, phase detect, and IR laser assist focus. The rear video camera can shoot 4K videos at 30fps, 1080p videos at 60fps or 720p videos at 120fps. The front camera is 8-megapixel. Essential PH-1 is a modular smartphone that comes with built-in magnetic strip on the back to attach add-on accessories. Essential PH-1 has a 3040 mAh Battery. Sensors on the Essential PH-1 are Fingerprint, Proximity / Ambient light sensor, Barometer, Accelerometer, Magnetometer, and Gyroscope. Connectivity options include Bluetooth: 5.0, WiFi: 802.11a/b/g/n/ac with MIMO, USB Type-C, NFC, GPS, and GLONASS. Dimensions of the Essential PH-1 are 141.5 x 71.1 x 7.8 mm. Essential PH-1 will be available in four colour variants – Black Moon, Stellar Grey, Pure White, Ocean Depths. Coolie’s son is fighting last stage cancer, slowly losing hope! Please help save him! Helping educate little angels, enabling them to dream and grow!